Book Collaboration: How to Hygge + Giveaway! Hello! I am back in the swing of things again after a long, long blog break due to a super-charged first couple of weeks back at work. There are some big changes going behind the scenes here at Avenue and I am excited to share it all with you over the coming couple of months, but for now I am excited about something else – a gorgeous book entitled How to Hygge that hit the shelves late last year, featuring my own photographs on it’s lovely pages. And to celebrate this beautiful book, I will be giving two copies away as a very small token of my thanks for your support in 2016. Knowing that there are people out there who read and are inspired by this blog motivates and drives me to be better in a creative sense, gives me courage to grow and explore and for that I am deeply grateful. 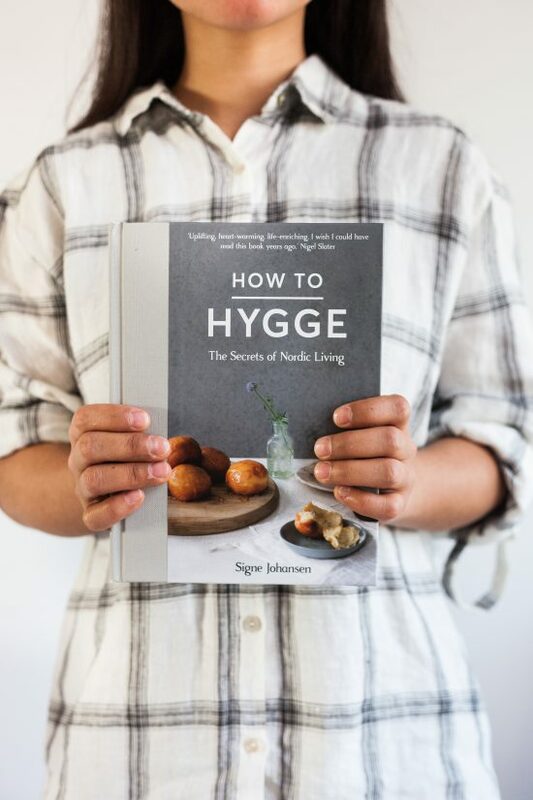 In How to Hygge, renowned Scandinavian cook and writer Signe Johansen explores the culture of hygge, shares the secrets of Nordic living and shows you how to adopt these elements into your everyday life. She explains the secret to feeling contentment, inner happiness and the art to living your best life, which Nordic countries have long been experts at despite the cold and lack of light much of the year. Translated roughly as ‘cosiness’, Hygge (pronounced: Hoo-ga) is all about warmth, conviviality and community. Its the celebration of nature, simplicity and togetherness. 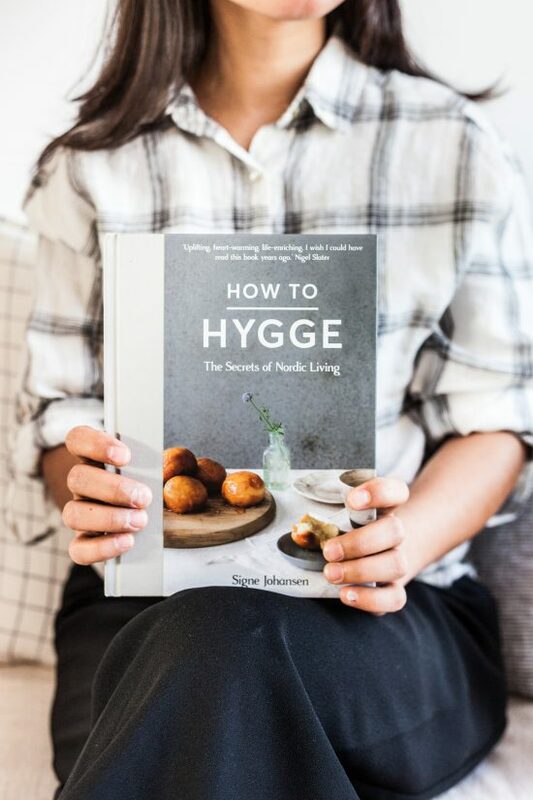 Across eight chapters, Signe shares her own experiences of Hygge including how to enjoy the outdoors the Nordic way, the simple joy of fika (coming together over cake and coffee), how to achieve a sense of community as well as 50 Nordic recipes. For those who have long admired the region’s stylish design heritage, this book reveals how to achieve the Scandi lifestyle that many the world over admire and aspire to. I was delighted and humbled that Signe not only found and read this blog but thought that a few of my photographs were fitting for her book. You will find a few familiar images in chapters 7 and 8 of the book, of spaces I have shot and tablescapes I have styled. Leave a comment below telling me what you love about Nordic lifestyle and why you’d like one of these books. Don’t forget to leave your email address so I can be in touch if you win! The winners will be announced on Instagram and Facebook on Monday, 20 Feb. The book is available for purchase through Amazon, Waterstones, Blackwell’s and several other dealers you can find on the publisher Pan Macmillan website. It makes a wonderful gift, of not for someone dear, then certainly for yourself! I have soaked up each and every page and have been deeply inspired by the culture and Signe’s stories. I’ll be back soon with the results of a slow but steady kitchen and living makeover at my house! If you’re new to the blog, you can catch up on the progress of our home by reading about the renovation here, our bedroom here and here, our little girl Lola’s bedroom and the studio here, here and here. I am excited to be adding a couple more spaces to that list soon! Stay tuned, folks, and have a fabulous week. I’d love to win a copy of this book! I had no idea you had contributed to it. I’m trying to bring a bit of Scandinavian style to my new build house while still trying to maintain my own look, so using Instagram and books like this is really helpful. Well, if the book is anything like your style I am sure I will love everything about it ?. Happy to hear that you are doing well and I can’t wait for the update on the house. This book is on top of my wishlist for sometime and now that I know your photos are in it, even more so! I was actually daydreaming (again) to have you style our whole house. Thanks for the inspiration. I will love to have this book because I love how Scandinavian style is simple, elegant, useful all at the same time. I will use this book to help me get some inspiration to decorate my house, and lifestyle here in France. books. Today is my birthday so maybe it gives me extra luck to win one of them. Looking forward to reading about the chances at your blog. 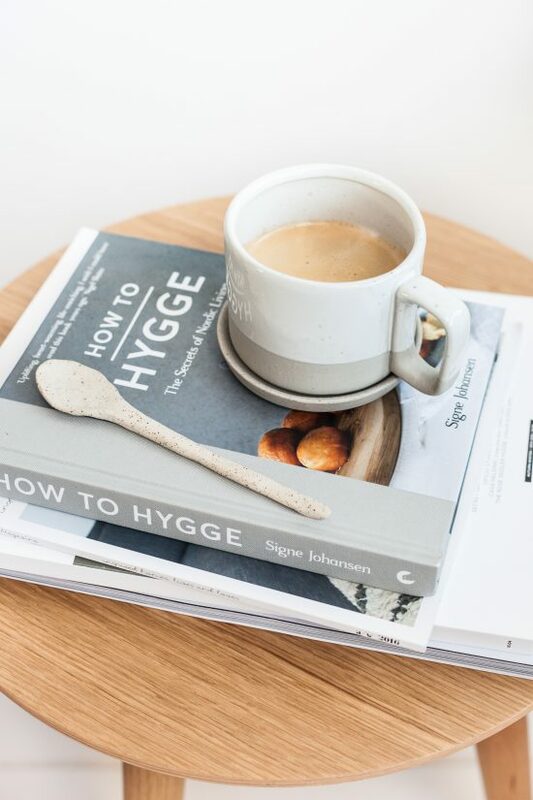 ‘How to hygge’ may just be the story of my life…i love everything related to hygge or the scandi lifestyle: the joy of spending time with loved ones, while savouring some good food and drinks. I would love to get to know more about nordic food and how to create the hyggelige atmosphere, so I am really looking forward to the book! Wow this seems like a fantastic book! I love the scandinavian lifestyle, i’ve been on holliday to Danmark and Sweden aa couple of years ago and I really love the way people treat each other. They are so welcoming and layed back. Also, they are very healthy without being obsessed with dieting or excersise. well, for starters it has the words ‘secret’ and ‘living’ in the subtitle. And I love having a sneak peak behind the scenes. Especially when its bound to cultural traditions that still have an impact in daily lives. The nordic lifestyle speaks especially to me, because it has this incredible mixture of clean and breathy designs combined with organic materials. Very soothing and calming. It’s cosiness at its best. Your blog and your creations, by the way, embraces this approach beautifully. I am completely hooked since I discovered AvenueLifestyle. So, this book and your blog revelations would be the perfect combo inspiration and help for the make over I just started in my apartment in Berlin. What I love about the Nordic lifestyle is the fact that they are so much more in touch with the basics of living with nature, eating well and spending conscious time with family and friends. And make it all look so pretty while at it. I work in a demanding government job and have a lot of contact with my scandinavian counterparts who have equally demanding jobs, but take more time to enjoy good food and talks both during and outside of work. One girl told me how in summer she bikes to work (1,5hrs away) and takes a break during that trip to swim in the sea. And in meetings, they have the best cakes, where we always give them boring pre-packed cookies. So, in short, I’d love to use the book to help me with a more purposeful day to day life too. Thank you for this awesome opportunity! I’d like to win the book because for me Nordic living means harmony and peace with nature, with the community, in our own homes and with our family. It is to enjoy the simple things without forgetting the beauty around us. Food is also important in our lives, and I think this book could add a beautiful hint in our domestic routine! This book looks beautiful! I draw a lot of inspiration from Scandinavian interiors – they are the masters of creating cozy spaces for long winters! In my own home I’m striving for a more uncluttered aesthetic; I often come to your blog for inspiration. Wow, congrats on being featured in this lovely book. I am a true Fan of the nordic lifestyle as I am half danish myself. I really Do enjoy the asthetics as they make me feel at home, now that I am not living in Denmark anymorw. It is very inspiring to see how to be able to create the feeling of hygge outside of scandinavia. this books looks just wonderful and I put it on my wishlist. I love the concept of Hygge (I even love the word!) and the Scandinavian way of life because – for me – it represents a very relaxed and cosy lifestyle. 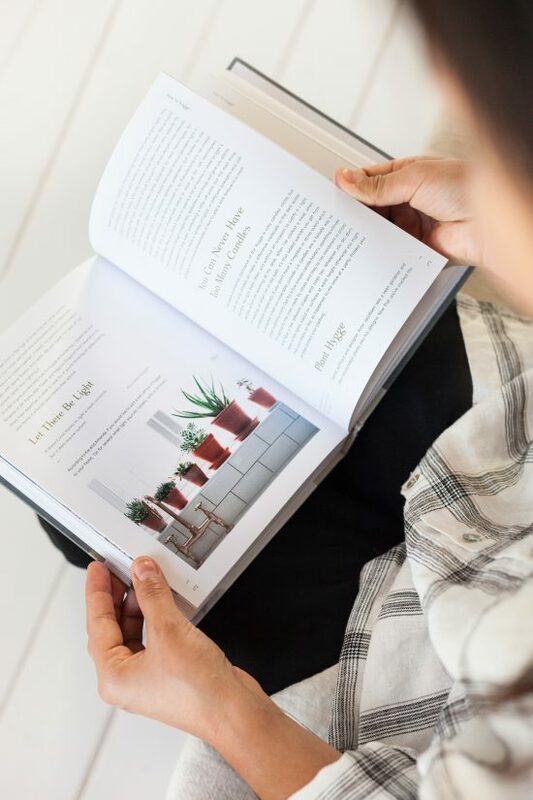 I love books, especially the feeling en smell of the paper 🙂 , I love cooking, I work with people and there homes and I love Scandinavia… so I am already in love with this book! Hygge Always sounds to me as Hug, hugging your life so you can live it in your own most beautiful way. Love and hug and keep on writing. I love hygge and scandinavian style because it combines coziness and warmth with space and clean lines. Perfect! I’m sooo in love with you blog <3 Every little thing you choose is just perfect. It inspires me peace, calm, nature, cozyness… I am renovating my house and hope to succeed in creating "your atmosphere" :). 2 months ago a both the book the little book hyyge. I was in love with this book! I love al the books about hyyge this book wil get a nice place in my new one hygge Bed and Breakfast which will open in may 2017. What a beautiful styling, Holly! What I love about Nordic lifestyle and design is the peace and simplicity it implies. No clutter, but coziness, space, light and calm without being to sterile. I love the combination of natural materials and neutral and muted colours in Nordic interior design. Hi Carolien! We are delighted to let you know that you are one of our WINNERS! Please get in touch with your address so we can get the book off to you – holly@avenuelifestyle.com. Thank you and make sure you reserve plenty of time to read this wonderful book! I love your work and I always have felt curiosity about the nordic style of life. I actually would love to live in one of the nordic countries. So this book is the best combination for me right now. Thanks for sharing so much. I’d also love to win a copy of this book! Sounds like just the fix for surviving a long Midwestern winter! The thing that I love most about the Nordic lifestyle is the simplicity of design. I really love that there’s an emphasis on quality, not quantity, and I’m also super inspired by how they carry this over to their clothing. Thanks so much for the giveaway and congrats on contributing to your book! I would love to win a copy of this book because in the first book about hygge from Meik Wiking (the little book of hyyge) I missed the wow factor in all the pictures featured. So I know this book will be great because you are in it and you have great sense, style which shows in your pictures. I can’t wait to have a look fika-style ofcourse. I love the coziness of the soft whites. I’d love to bring some hygge into my occasionally ‘cold’ California winters. Because books can inspire you. And I’d love to be inspired to bring more hygge into our family life. Hygge, for me, is about the pleasures of life that we can share with others. With kids, work and everything else in life, it’s sometimes hard to not overlook the important things in life. And I often fall into the trap of thinking I won’t have time to organise big get-togethers with my friends and family. I love how the concept of hygge emphasises simplicity. And I very much believe that simple things can bring so much more beauty and joy. 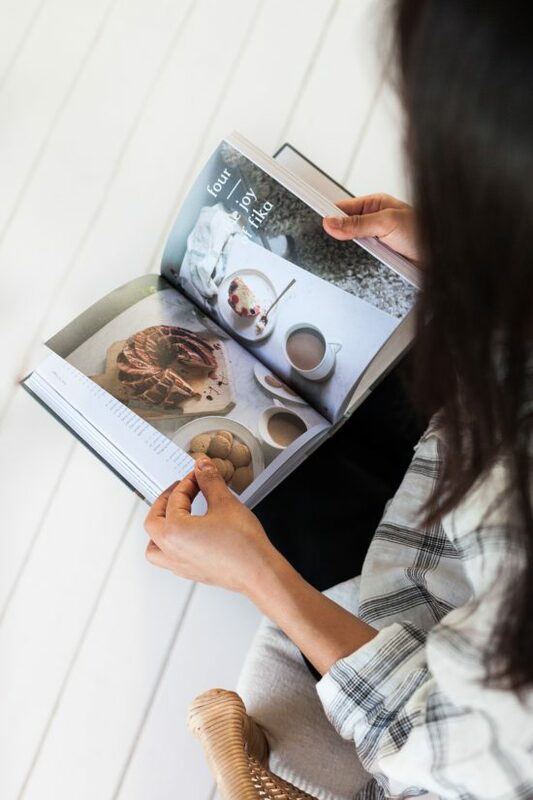 Food, beautiful design, cosiness, the pleasure of sharing and get-togethers..of course I’d like a book full of beautiful pictures and uplifting advice on that! My wife would love this book! She gets so excited when we watch a Nordic tv show. Not just about the plot, but about the kitchens, and the lampshades, the knitted sweaters, and the music. And the light. The furniture. All of it. This book would bring her more of this joy. 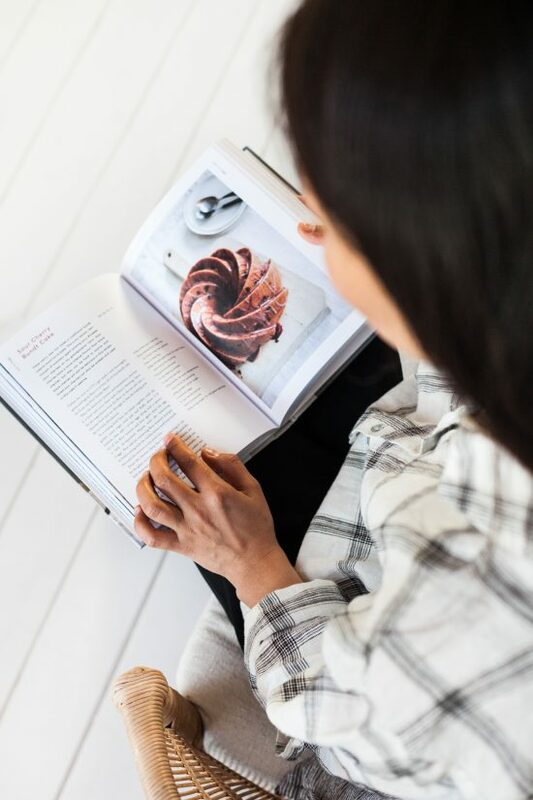 And I love baking, and ‘How to Hygge’ would let me indulge in that, too. This book would be the perfect read to relax by a crackling fire, when the wind and rain are raging outside and battering on the windowpanes. After brewing a pot of Earl Grey, and pouring a mug full to the brim of the steamy, fragrant drink, I would delve between the pages of Signe’s book, and enjoy learning more about the Nordic culture and traditions. 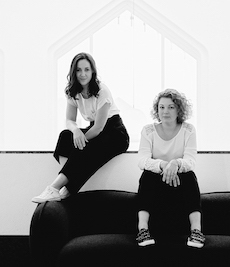 As an aside, I love your blog and style Holly, it’s one of my favourite sources for inspiration. We’re just finishing up a reno to our hundred hear old vancouver house and after years of shabby chic we’ve and a trip to scandanavia we’ve shifted our design style. your blog has been a great source of inspiration to us. Thanks and congrats on the book. I would love a copy for my bedside table. As a family and as small business owners we are always trying to figure out how to make more of our days. Our life is going through a planned and wished change, but things are not always easy. We are starting to understand the importance of relaxing and quality time for each other as well as for our family (we are proud parents of a teenage boy, a great reminder that time flies so rapidly!). The minimalism, the coziness and the joy of simple yet meaningful moments of Nordic Lifestyle are really inspiring. We would love to win a copy of this book for an extra motivation to find time. Beautiful photography! Fika is definitely something I can get behind! As someone who works behind a computer screen, reading about the nordic lifestyle has reminded me to take a step back and appreciate my surroundings and community, take things day by day rather than getting caught up in the bustle of deadlines. I have two children with disabilities and it can be hard to get out and about. In the spirit of “if life gives you lemons…”, I have been working on making our home the best, most cosiest place it can be so we hardly miss going over places. I have taken lots of inspiration from Nordic living. Sorry for duplicate comment; I can’t even write a short comment without one of them interrupting me! Hello Holly and thank you for a beautiful gift. I love the simplicity and freshness with which Hygge embraces the most important aspects of life like meeting with and taking care of other people or embracing every day life artfully. I would love to study this mentality deeper as currently with my family we are preparing to move to a new home and give a fresh start to many aspects of our life. Thank you once again! Looking forward to your posts! How thrilling to see your photography in the book – I would love to win a copy! I was just talking with a colleague about the “Hygge” lifestyle the other day, and have lived myself in Oslo for a while. Scandinavia impresses me with its nature and relaxed people, they live life very fully despite the lack of sun and warmth. It’s a beautiful way of life and I always find inspiration in it. You´re the first person who should be asked about Hygge! I absolutely get that feeling from your pictures! I would love to learn more about it and about the delicious recipes. And of course, this would be a book to display in the kitchen! Hi Holly, this is great, congratulations!! Your work is so beautiful & I love it so much because for me you are a wonderful example of the scandinavian lifestyle. It is so inspiring & with so much love to detail. 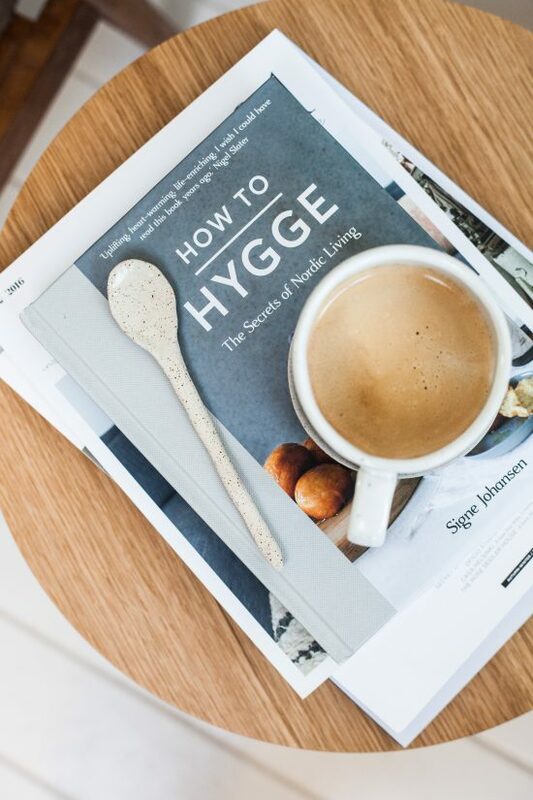 I would love a copy to experience “Hygge” a little bit closer in my everyday life & kitchen! All the best & I am very excited to hear all about your new projects!! 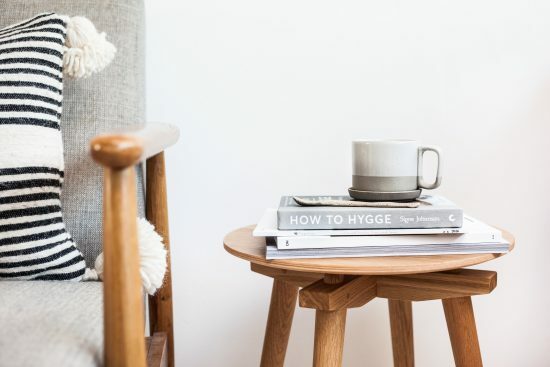 I always feel that simplicity and beauty is required for a Hygge lifestyle and this blog perfectly embodies that–stuck in the cold of Chicago, sometimes Hygge is all that gets me through the winter months! I think I like most that people are happy in the Nordic countries, despite the more difficult weather conditions (I bet it was not that fun back in times to live there). I’m curious whether this book answers how they managed to do it, thus I’d love to read it. Looking forward to your new projects! I love the Scandinavian ability to attempt to love the winter instead of just live through it. Apparently Canadians complain about the weather more than any other nationality, and as a born and bread Canuck, I’d love to learn to love it instead! Living in Canada where winters can be cold and long, I’ve really taken an interest in how other Northern cultures embrace this time of year and make it something to look forward to. Would love to learn more about “How To Hygge”! There is something magical about the scandinavian lifesyle for me: the light , the natual touch, the beautiness of simple things. The book would be An inspiration for the new house that i am about to buy. The owners said hes to my offer this week. .. But also your blog and pictures are a truly source of inspiration. I am a fan. I have simply always loved scandinavian interiorism and style in general. It is symple yet full of character. I guess what it teaches you is to fall in love with the little things. Simplicity. I recently moved to a gorgeous country. The downside is the amount of light I receive is pretty much non existent, compared to the tons of natural light my home is well known for. Hence, this book comes in the perfect moment in my life. I am eager to read and learn to love this light, embrace the little things. And since I got rid of almost all my possesions while moving, for this fresh start I need a little inspiration for my new me. What I love about Scandinavian lifestyle is how much they do with so little. I’d love to win the book as I am on my way to slow down my life, and I’m sure this is gonna be a great inspiration. live in the Nordic countries! Your aesthetic style is always an inspiration for me. I’m looking forward to your home’s “home tour”! Hi Christina! We are delighted to let you know that you are one of our WINNERS! Please get in touch with your address so we can get the book off to you – holly@avenuelifestyle.com. Thank you and make sure you reserve plenty of time to read this wonderful book!